I like how it has R. wichurana on both sides. So does it lean more towards R. wichurana or more towards Floradora in your opion? Oh, definitely R. wichurana. Its just like a dwarf, bushy pink R. wichurana. There's really nothing of the character of 'Floradora' about it. You know I love the idea of using 'Scabrosa' because I used it a lot last season myself. I also find it interesting that when you used 'Scabrosa' as the pollen parent on a wichurana based plant it took... any pollen from plants with a strong wichurana influence, including quite a few polyantha like 'The Fairy' and 'Baby Faraux', put onto 'Scabrosa' failed for me last season. The closest I was able to get to stick was 'Magic Carrousel' which has wichurana 3 generations back and it produced very little seed (only about 10 seeds per hip) compared to the other tetraploid crosses with 'Scabrosa' that produced up to 92 seeds per hip. I think I will also try your idea this coming season and use it (and 'Ann Endt') the other way around on the wichurana based varieties that failed last season but which set a prodigious amount of OP hips (though, again, taking your advice I am test germinating lots of these OP wichurana hyrbid seeds to assess germinability... so maybe I should reserve such decisions until after I see their strike rate). I try not to use the "purebred" Rugosas as seed parents, partly because they self-pollinated long before the bloom opens, making it difficult to get your pollen to do what you want. I do occasionally use one as a seed parent but I wash the stigmas with a spray of water after emasculation, allowing it to dry and then pollinating, to ensure that it is MY pollen that is ferilizing the ovaries. Why my Wichurana hybrid is accepting such a wide variety of pollens I don't know, but it has taken almost anything I have put on it. But then, I do try to limit my selections to diploids, and that may play a role. Paul, how does the miniaturisation come about in such a hybrid? I don't think you can say that this is "miniaturization" in action, but simply a dwarfing like what we've seen happen in the Polyanthas and other compact shrubs. There is a direct relationship between continuous blooming habit and dwarfness: its as though the plant is coded to bloom rather than grow infrastructure. 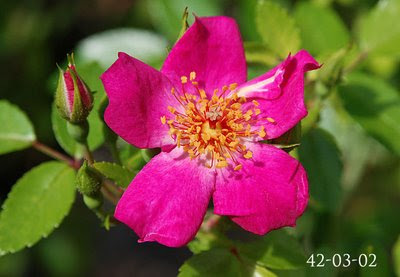 And so, what you sometimes get is a short, compact shrub that is almost always in flower. I have seen plants of this type emerge from 0-47-19 fairly often: they bloom while still very young and rarely have the same vigor as their more vegetatively-oriented siblings. What mechanism is responsible for manifesting this type of plant is anyone's guess. Thanks Paul, this helps me understand this a whole lot better!